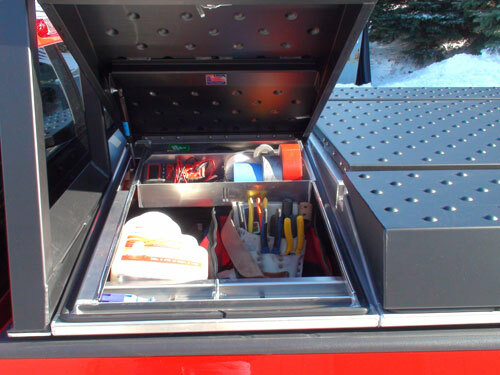 Need to carry more tools but don't want the expense of a service body? 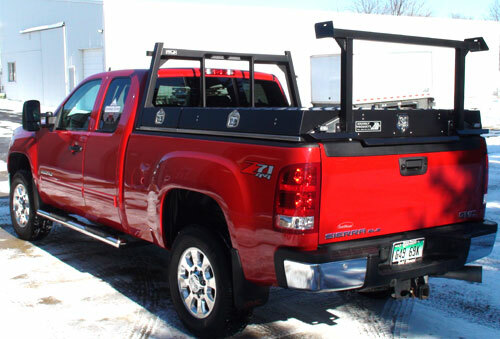 This "service body" Pickup Pack™ for Pickup Bed includes a gull wing saddle box, two lockable low side boxes, a removable flat or dome center hatch, a headache rack, and a removable ladder rack. 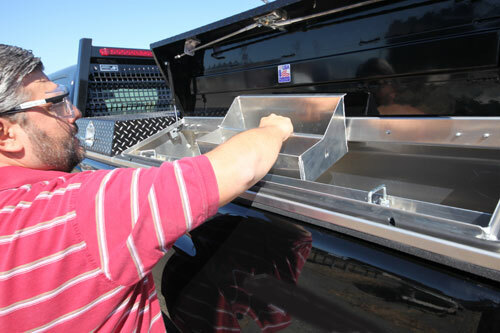 When closed, the hatch locks the tailgate, making the bed area secure and weather resistant. There is still an 8-10" space beneath the tool boxes for sheets of plywood or other cargo. 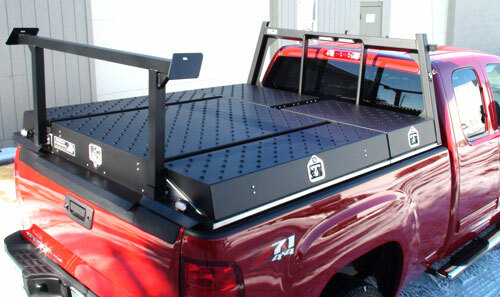 For the ultimate use of space, add the optional 2,000 lbs capacity Roller Coaster Slide-out Cargo tray in the truck bed. 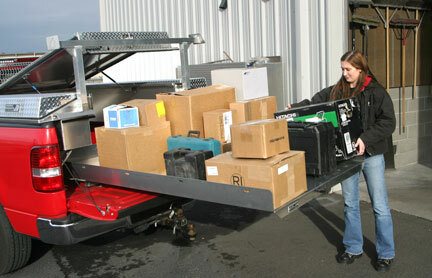 With it's 2,000 pound capacity, your cargo comes to you with an easy pull. Safety locks in increments of 10" keep the tray where you want it. 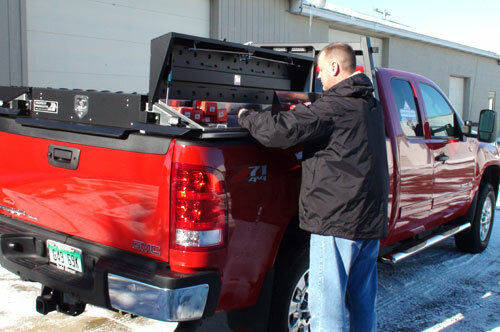 The Pickup Pack™ is a unique alternative for companies needing organized storage and lockup security without the cost of a service body. 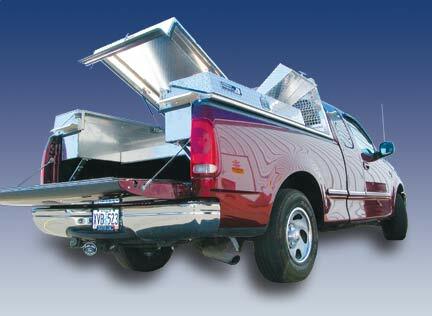 All in an attractive aluminum body that can be easily installed on your pickup in a few hours. 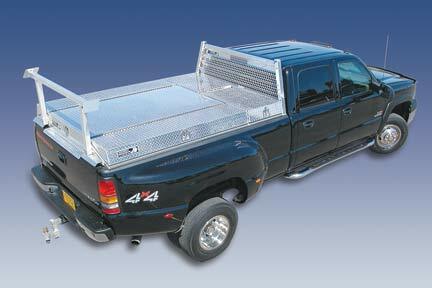 Low profile lid design allows easy access even for 4x4 trucks. 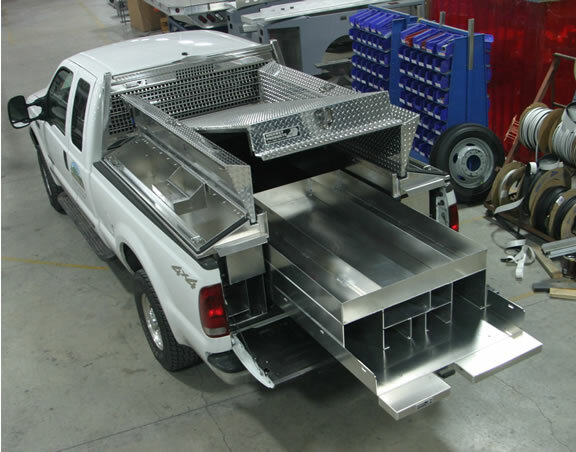 This "service body" in a Pickup Pack™ includes a gull wing saddle box, two lockable low side boxes, a flat or dome center hatch, a headache rack, and a removable ladder rack. 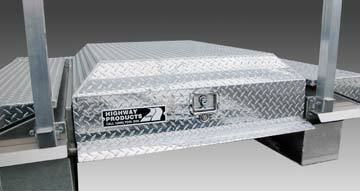 When closed, the hatch locks the tailgate, making the bed area secure and weather resistant. There is still an 8-10" space beneath the tool boxes for sheets of plywood or other cargo. Caution or emergency lights. Special brackets on request. Side box storage with lift out and carry trays. 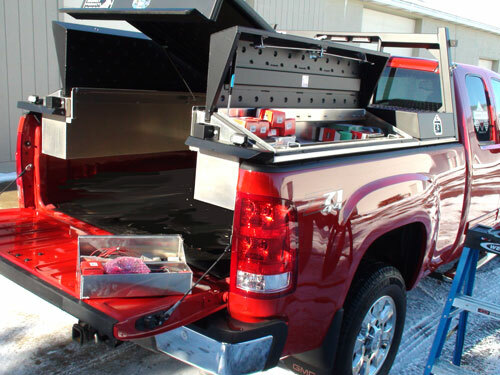 With the added benefit of being able to design this unit to fit your needs, the Pickup Pack™ may carry all your tools with even better accessibility. Why? Because it's easier to see and retrieve most tools or supplies from the top. No bending over to find what you need. Cross box for lots of organized storage. 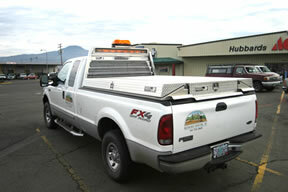 Notice lift-out and carry tray on tailgate. Very handy for taking tools to the job. 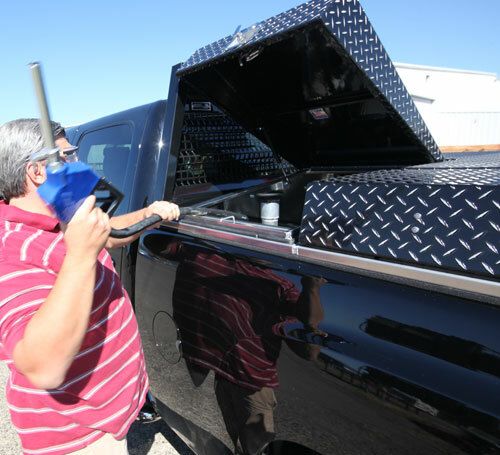 Below Pickup Pack™ being set up for law enforcement. Carry's a lot gear for all kinds of situations. Night shot shows headache rack with brake lights which are also turn and marker lights. Rear rack is removable. 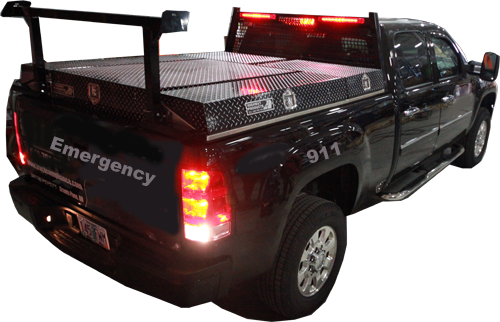 Tapered lid design allows for lower access, even on this high profile truck. Factory installed if you like or install it yourself. Mike demonstrates the Highway Products Roller Coaster™ ordered with this Pickup Pack™. Pull your tools out where you can get to them. Need a transfer tank. What size? Lift out trays are handy to take an emergency kit, tools, ammo, etc. to where you need it. Plus, another shot of the our low profile lid design. Add a Roller Coaster™ for even more space, as seen below. Plus, our clear-view headache rack let's you easily see out the rear window for backing up or rear view safety. 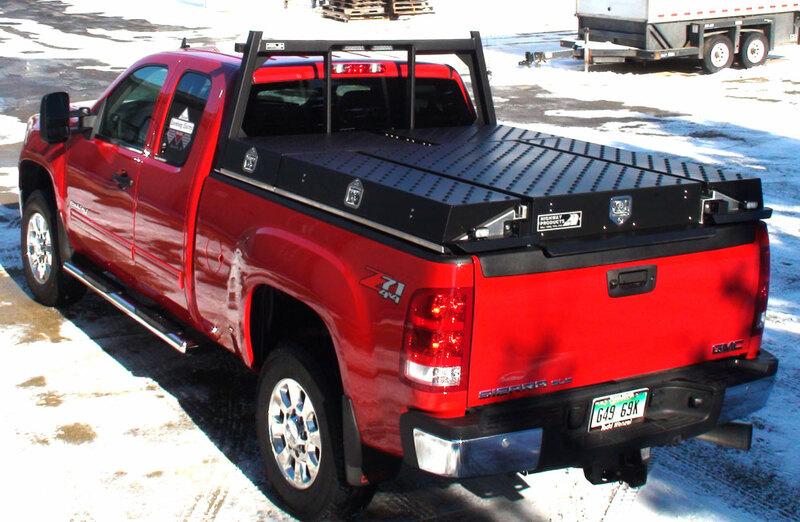 For the ultimate use of space, add the optional Roller Coaster™ cargo tray in the truck bed. 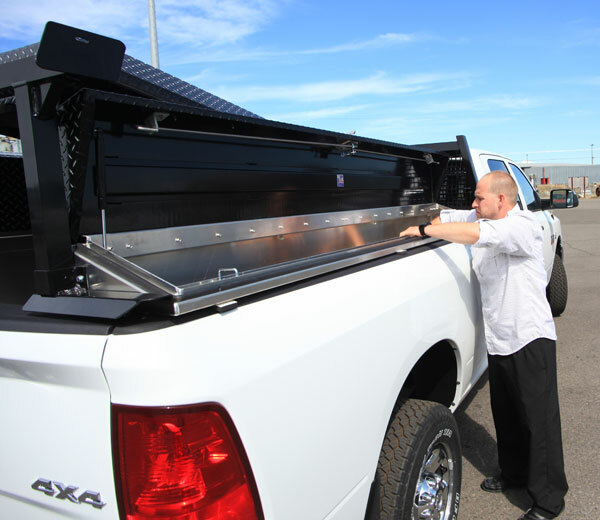 With it's 2,000 pound capacity, your cargo comes to you with an easy pull. Safety locks in increments of 10" keep the tray where you want it. Your Pickup Pack™ will be customized to meet your special needs by our design team; not a shelf item. That's one of the biggest benefits you get from Highway Products. Imagine a specialized, organization system built just for you. You'll save time trying to find your tools, have a place for each supply item you carry, look professional, and save money at the same time. "I installed the Pickup Pack by myself in approx 1-1/2 hrs. The quality and construction far surpassed my expectations. Finally an American company that is capable of producing a quality product. You can use me as a reference anytime. Thanks again for a phenomenal product." "Dear Obie, thank you for suggesting a Pickup Pack™. It saved me some bucks and works perfect. The hardest part was getting it out of the crate it came in but it arrived in perfect shape. I was back on the road the same day I got it and after putting all my supplies I carry in it I still had lots of room left. A great product." 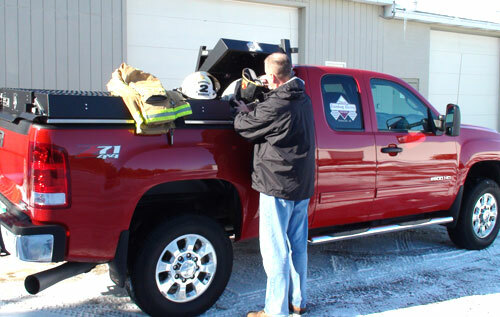 Contractors tell us they use their trucks fitted with the Pickup Pack™ as their mobile business office, keep tools and inventory for the job locked up in it, ready to go when needed. Our products are made right here in the U.S.A. from tough, marine grade aluminum, using 1/10" and 1/8" stock. The same materials we use on our semi truck tool boxes we're famous for. Plus, we're proud to say our truck boxes have been time-tested and upgraded under some very challenging on and off-road conditions the past 32 years. Time testing is the ultimate test in any product. Another benefit from us to you. Add style to your work truck! With a powder-coated finish of your company colors. Then add our pat. pend exposed diamond look. 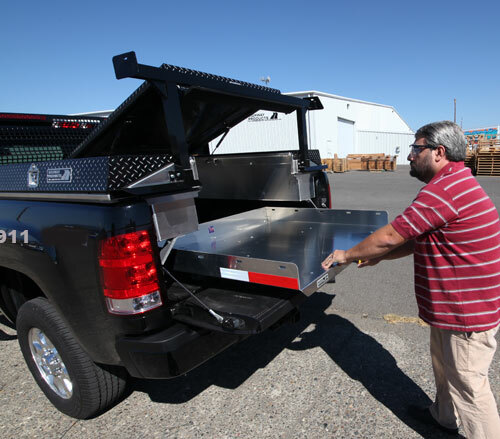 (left) One of our Sales Staff, Obie Hansen, demonstrates how easy our low-entry style doors allow you to get to your tools even at his height of 5' 6 inches on this high profile 4x4 pickup. Nine reasons your company will save money by purchasing a Highway Products Pickup Pack™. 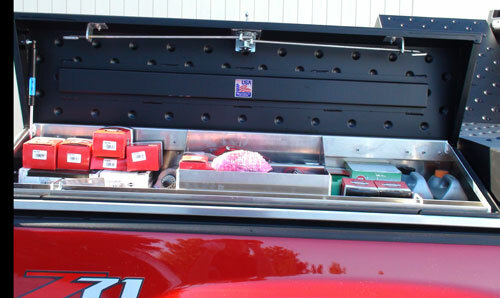 1) Initial Cost: Very often you just don't need the room of a full blown service body to carry your tools. 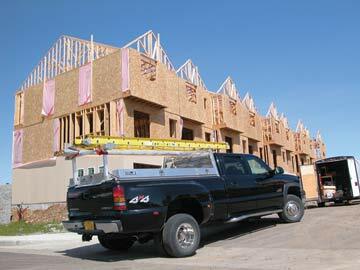 Pickup Packs™ are inexpensive compared to the cost of a service body. 2) Smaller Truck: Most of the time a 1/2 ton pickup works fine with a Pickup Pack™ where a 3/4 ton is needed for the service bodies. This saves you money on the initial cost of the pickup truck itself. 3) Better Gas Mileage: A smaller 1/2 ton pickup uses a lot less fuel than a 3/4 or 1 ton. 4) Cheaper Installation I: Pickup Packs™ take 2-4 hours to install. They come in a crate, already put together. Install it yourself and save even more! 5) Cheaper Installation II: You don't have the expense of an upfitter to take the factory bed off your truck and install a service body. 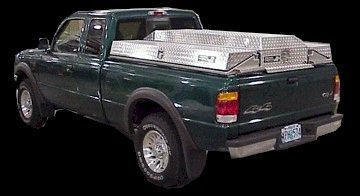 6) Cheaper Reinstallation: You don't have to put the pickup bed back on your truck to sell it. 7) Cheaper transfer: If you buy a new truck, you simply lift your Pickup Pack™ off your old truck and place it on the new one. 8) Higher Resale Value: The service body costs to transfer are generally not worth it so they usually get sold with the old truck. You end up buying a new service body every time you buy a new truck. With a Pickup Pack™, your old truck still has the original bed on it which will sell a lot faster and for more money than a truck with a service body or without a bed on it. 9) On the job the same day: With a few hand tools and an electric drill you can be on the road the same day. 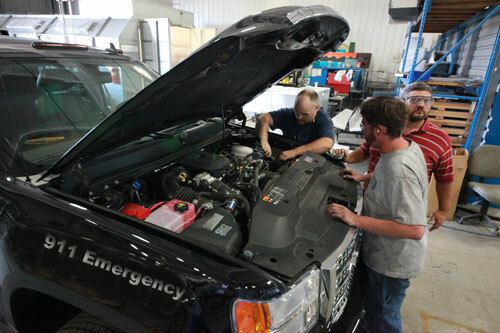 Upfitter's tight schedules may take weeks before they can even get started on a service body install on your truck. This specially designed Surveyor Pack™ clearly shows the space available. The Roller Coaster™ cargo slide can be designed to your company's needs. 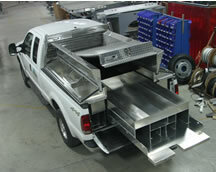 And you can pick the type of truck bed boxes you desire. 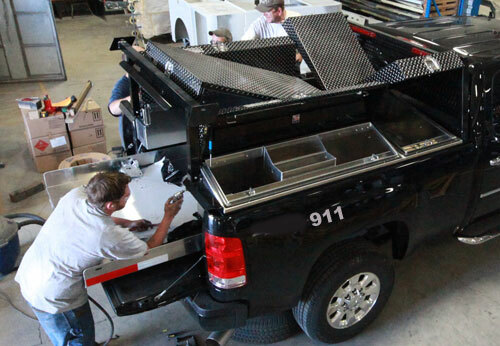 Turn your pickup into a customized work truck in a couple hours. 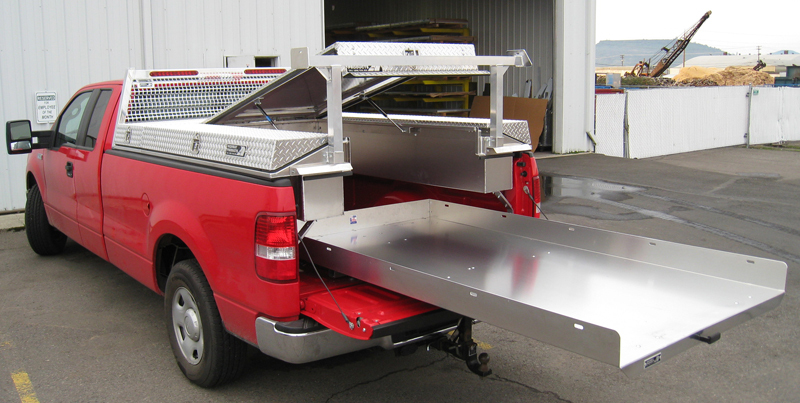 Headache racks can be designed with brackets for your special light package. You pick the lights, we get the spec's from the manufacture. 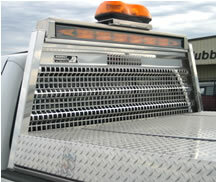 Pickup Pack™ shown on a mid-sized pickup truck with dome style hatch. 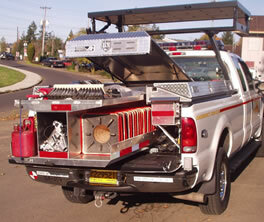 The Pickup Pack™ is so versatile, we can easily be redesign it for many uses. We have a Pack for Surveyors, and for Veterinarians. But have special built them for tree doctors, gas companies, water districts, electricians, US Government, pest control, and general contractors all over the country. It's a good chance we have done some for your type of business. One way to find out. Give us a call. Problem: Keeping your expensive instruments safe, dry, and easily accessible. Solution: Highway Products Pickup Pack™ with our Roller Coaster™ turns your normal pickup into a unique storage system in a couple hours. John from Neathamer Surveying Incorporated in Medford, Oregon says he likes this unit hands down over the camper shell they had before. "All my tools are right at my finger tips", says John. Neathamer Surveying Incorporated now has four of these units. 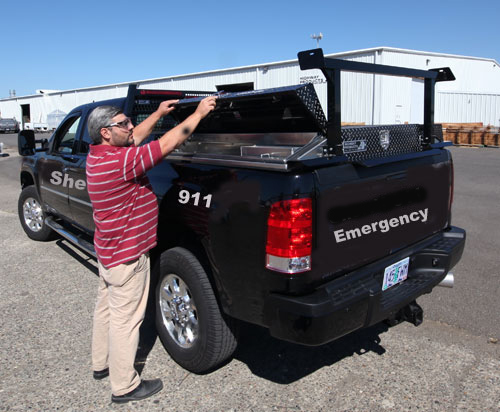 Oregon Department of Transportation D.O.T.uses the Pickup Pack™ with a customized Roller Coaster™ to monitor their highways. When ever there's a vehicle crash the D.O.T. 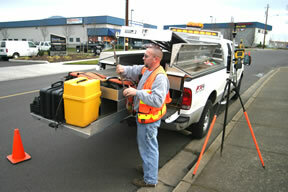 is there to help get traffic rolling again and making sure any spills are contained. Actually these are only a few of the many things we know they do. When they arrive at an accident, sometimes things are out of control. 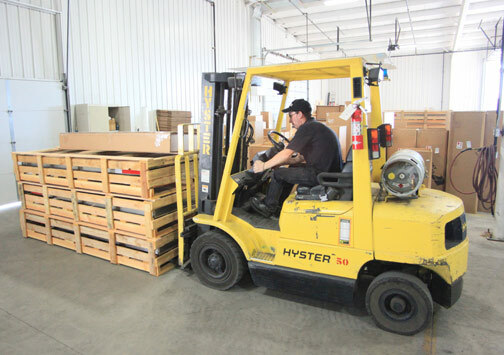 Getting the control back is essential and knowing where everything is saves valuable time. 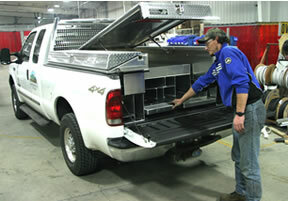 All pickup tool boxes are covered by a Lifetime Limited Warranty. Your Pickup Pack will come pre assembled in a well built crate to protect it during shipping. 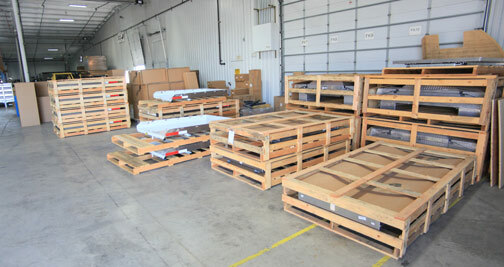 Although these crates can be dropped off the back of the delivery truck, a forklift is handy to move it around. 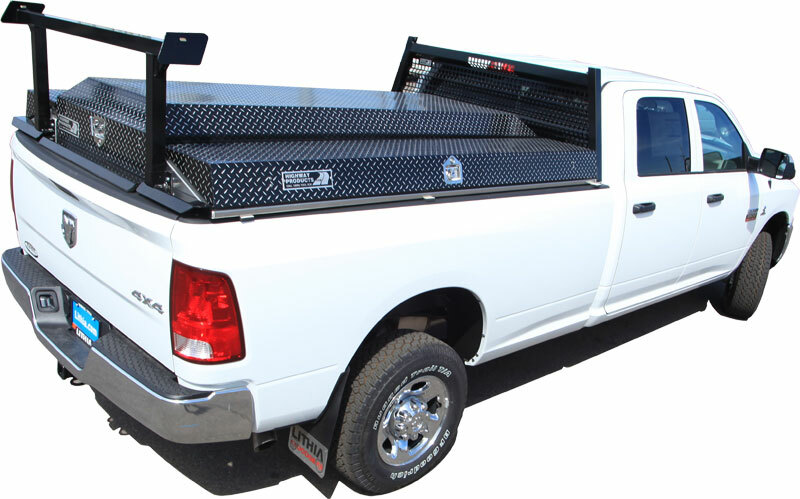 Call and get a quote on a Pickup Pack™ for your truck, or fleet? Our products are the best of their kind. That's the way it is and the way it will always be. Gene Gros - President CEO - Highway Products is a family owed business. Our products are Made in the USA.